We can mask the code from lighting the dash light, but I don't think it will prevent limp mode. I have a few questions and figured this may be a good place to ask since it may help others instead of emailing them directly to you guys. 1) I have a 2004 RX8 and with Versatuner loaded. I only see 2 Fuel Enrichment maps and 2 Air Fuel Ratio maps, not 3 like your post shows. Is this correct or is something messed up in my case? 2) The Desired Air Fuel Ratio logging parameter seems to correlate to nothing tangible... During closed loop it seems close to what the Actual Air Fuel Ratio is, but does not match either of the 2 Air Fuel Ratio maps I can see, in open loop it varies wildly settling in the .995+ lambda range with seemingly no effect on the Actual Air Fuel Ratio. So my question is, what exactly is the Desired Air Fuel Ratio logging parameter? 3) The Air Fuel Ratio Base number is referred to from the Closed Loop Air Fuel Addition table, which seems like it should be stoich if we are basing closed loop fueling off of it, but in my experimenting it seems to have no effect at either cruise or WOT. What does this value affect? I have some more questions, but I think those answers would clear a lot of the other odd behavior up as well. I admit this is my first venture with flash tuning setups, so some of my questions may be noob-ish, I'm just used to standalone setups where I have the full equation at my disposal and it's simple to figure out what each table is contributing and affecting. will you be adding cranking fuel enrichment and timing, to help with E85 cold start. I converted to e85 and having issues with cold start since it's getting colder out. I plan on purchasing Versatuner and have a quick question. My car has not had the MSP16 flash performed and I would like this update. 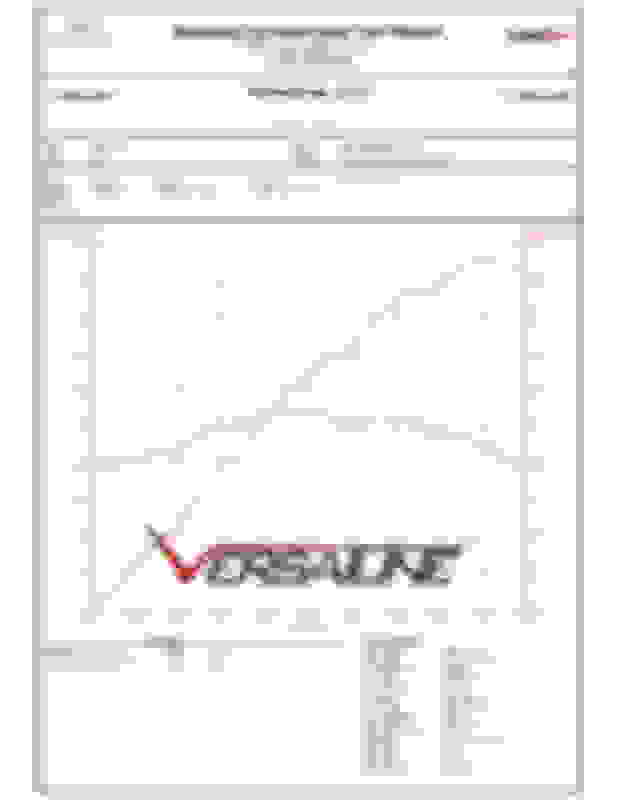 I was reading Versatuner works with the latest "base map" or "software version" and was wondering if the MSP16 flash would be made redundant by using Versatuner? Thanks! What calibration ID is on your ECU now? Seems my scan tool doesn't display this. I'll update this post within a month or so once I get everything up and going and can pull the cal ID. Update: my calibration ID is N3M5EH. Second Update: I decided to go ahead and use MMP to update now I'm on N3M5EK. Problem solved! Last edited by Kimura; 12-10-2018 at 12:02 PM. 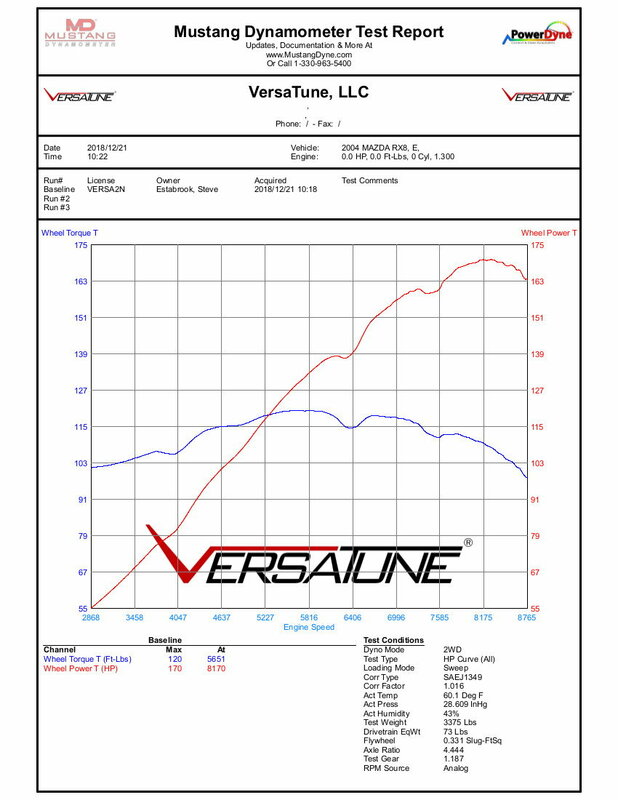 We did the first baseline dyno on the shop RX-8. It seems a bit low. We'll go over the car and see if there is anything out of order. Last edited by [email protected]; 01-14-2019 at 09:50 AM. Coils, plugs, and wires ordered! Racing Beat REVi intake ordered! Full TurboXS header + exhaust ordered! seems normal numbers for Mustang dyno? my stock 06 with 74k miles made 165 ish on mustang.